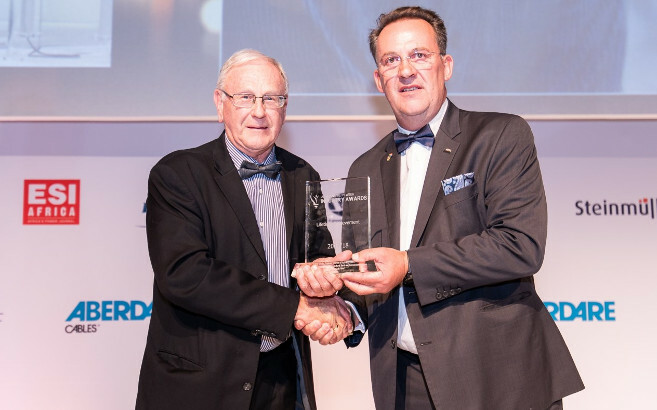 Professor Roland Schulze, UKZN Hydrology Professor Emeritus and Senior Research Associate in the Centre for Water Resources Research (CWRR), received a Lifetime Achievement Award at the African Utility Week Industry Awards which recognises energy and water influencers in Africa. Over 600 guests from 30 countries attended the glamorous black-tie event, many of them Africa’s most renowned power and water industry professionals. Schulze was selected winner of the Lifetime Achievement Award by a panel of 22 international judges. ‘This is a proud and emotional moment and a humbling experience,’ said Schulze, who also reflected on the individuals and institutions who influenced his outlook and success, including his parents whose dreams were cut short by the Great Depression, leading them having to curtail their schooling at the age of 14 to start work. Schulze, who completed his undergraduate, Honours, Masters and PhD studies at the then-University of Natal, began his career as a high school teacher of Science and Mathematics, joining his alma mater in 1969 where he worked until formal retirement in 2007. He piloted South Africa’s first hydrology degree course in the early 1980s; the discipline grew under his leadership to form the CWRR, now training more than 150 undergraduate students and 30 postgraduate students from around the world annually. Schulze was also visiting professor at the IHE Delft Institute for Water Education in The Netherlands and at the Swedish Meteorological and Hydrological Institute. He has been involved in more than 100 short courses on hydrological modelling and climate change in South Africa, Africa and Europe. Schulze’s involvement in national and international level hydrological research spans more than 50 years. For the past 30 years, he has been pursuing applied climate change research. Landmark achievements include development of the Agricultural Catchments Research Unit (ACRU) agro-hydrological modelling system and the SCS-SA design hydrology simulation model. He has over 600 varied publications to his name, from refereed journal papers to books and popular articles, with further publications forthcoming. He has spent six sabbaticals at institutions in the United Kingdom, Germany, the United States and The Netherlands. Schulze has supervised 67 Masters and 20 PhD students, with eight students currently under his supervision. His graduates have gone on to make a considerable impact in various sectors. Schulze’s accolades include a Fellowship of the University of Natal, a Fellowship of the Royal Society of South Africa, Life Membership of the International Water Academy in Norway, a South African Institute of Agricultural Engineers (SAIAE) Fellowship, Membership of the Academy of Science of South Africa and numerous “Best Lecturer” awards. He is the recipient of Gold and Silver Medals from the SAIAE. He has served on editorial boards of several international scientific journals; numerous South African National Committees and advisory committees; and on 74 WRC Project Steering Committees. Internationally, he has served on various boards/committees in numerous capacities for organisations including the United Nations, European Union and UNESCO. Outside academia, he has served on the Board of Deutsche Schule Hermannsburg for 22 years, on his Church Council for 11 years, and on the Board of Trustees at Kew Gardens. Schulze has been invited to more than 170 overseas engagements as a conference speaker. His vision for the future of his field is one in which hydrologists and water managers fully understand the processes involved in a highly complex and non-linearly responding hydrological system in a water-scarce country. He emphasises that they will need to be technologically astute, innovative and adaptive, taking a nexus perspective by integrating water security with food and energy security.